After an intense year of testing and racing, Mugen Seiki is excited to announce information about the MTC1 performance conversion kit. All the new parts were used at the Reedy Race of Champions EU, where all 3 prototypes MTC1fs ended up in top 10 of the modified class. The prototype MTC1 was able to log some of the fastest lap times of the entire event! Testing with the prototype MTC1 on asphalt has also shown great results. Most testing was been done by pro drivers, but we also did testing with hobby customers and the testing displayed great results for drivers of all levels. - New upper deck with pitch control rod. Mugen Seikifs new pitch control rod system prevents the chassis from bending over the maximum length, as it is fixed from the motor mount to the upper deck. Furthermore the flex of the chassis is not affected from the rod. It improves the acceleration significantly especially on carpet or high grip conditions. - New C-Hub front suspension. After intense testing we found out that the C-Hub suspension system, in combination with a different wheel axle position, is much easier to drive then the original design. The new softer O-Rings providing less friction and both shocks and differential are working more smooth. This makes the car easier to drive especially on bumpy tracks or tracks with curbs or dots. The new material of differential gears provides increased durability and smoother operation. This will also allow you to do more running between rebuilds. The aluminium outdrives increase the durability of the outdrives. Simply change the composite blades from time to time for increased durability. 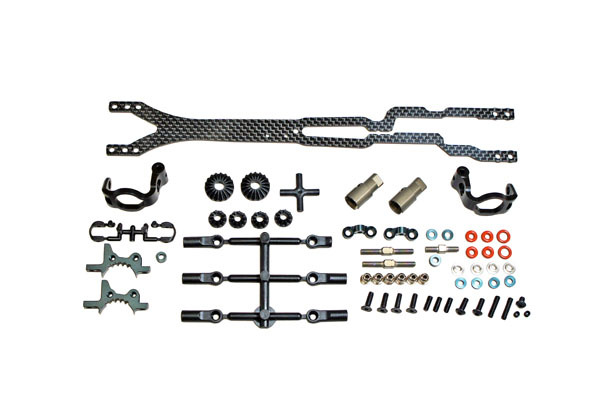 All in all, the MTC1 performance kit improves the car durability and performance significantly, and makes the MTC1 highly competitive in the electric touring car class for drivers of all levels.